NEW BRITAIN - It was a celebration of acronyms, of music and of art. 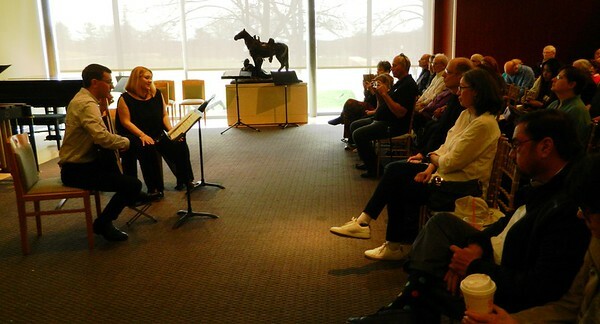 The New Britain Museum of American Art (NBMAA) hosted the Hartford Independent Chamber Orchestra for a concert Sunday.Members of HICO were joined by a guest vocalist from the Hartford Opera Theatre (HOT). 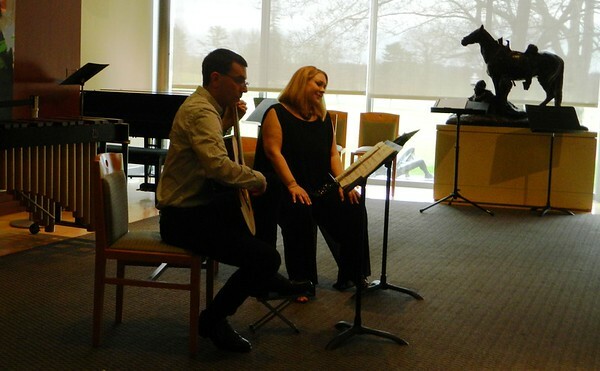 Soprano Michelle Fiertek sang with the guitar accompaniment of Thomas Schuttenhelm, who composed the piece. Schuttenhelm also composed the program’s finale, a piece inspired by one of the works inside the museum, artist Kim Keevers’ abstract, “3062 B.” Keevers’ work is currently on display in NBMAA’s “The Beyond” exhibition. The event also represented HICO’s world premiere of its newly formed brass quintet. Executive Director Cathryn Cummings thanked the large audience for coming out to the concert on what was one of the first warm days this year. The NBMAA’s Stanley Works Center was packed with at least 120 people. As a former member of the U.S. Navy’s Music Program, Cummings performed for Presidents George W. Bush and Jimmy Carter. HICO comprises an ensemble of 16 accomplished musicians, who, like Cummings, are based in Greater Hartford. They perform under the baton of Artistic Director Daniel D’Addio, a trumpeter and conductor with a long history in music. D’Addio is professor of music at Central Connecticut State University. He also serves on the faculty of the Hartt School Community Division and is music director of the Connecticut Youth Symphony. Posted in New Britain Herald, , New Britain on Sunday, 14 April 2019 21:44. Updated: Sunday, 14 April 2019 21:46.